Calling all inventors, curious minds, creatives, entrepreneurs, and dreamers. If you identify with any of these or are fascinated with what the future may hold, then the Maker Faire may be for you. Maker Faire is a two day festival celebrating science, engineering, invention, and art. It is a family friendly event and has something for everyone. The Maker Faire happens once a year in New York City, Detroit, and the Bay Area. Mini Maker Faires are popping up in places like Houston, TX and Santiago, Chile. As Maker Faire becomes more popular with inventors and fans around the world, I hope to see more Maker Faires hosted in different cities. The Maker Faire is in its sixth year and started in San Mateo, California. The 2012 Maker Faire in New York City was hosted at the New York Hall of Science in Queens. I snagged a discounted ticket through Living Social. I recommend attending the Maker Faire even if you have to pay full price. It is an excellent family friendly event. Even if you don’t have kids in tow, the Maker Faire is still very entertaining. It is inspiring to see what new ideas are flowing out there and what people can do and make with whatever resources they have available to them. Two trends I noticed at the Maker Faire were 3D printers and robots. Makerbot printers were everywhere and what people were designing included everything built from plastic to furniture sculpted out of wood. The small basic printers created jewelry and art pieces. Large scale 3D printers had the capability to sculpt intricate details. If machines were not present, then robots were. Legos and programming went hand in hand as people created robots that could pick things up. One robot could even help around the house! My favorite robots were programmed to dance to Gangnam Style! The Maker Faire was jam packed with activities, presentations, and interactive displays. There was something going on everywhere from cupcake cars driving around and a life size Mousetrap replica to a Mentos Coke Zero explosion and a go-cart race. Young minds were encouraged to test their creativity and engineering skills by designing their own wooden car and seeing how far they would go on a car roller coaster based on aerodynamics. Last but not least, the Maker Faire was hosted partly in the New York Hall of Science. This gave everyone the opportunity to explore the recently renovated center. Some might say that the Hall of Science is really for children under the age of 12 but I beg to differ. The Hall of Science is so educational and captivating that anyone, whatever age, would find it an interesting place. I had a blast with the hall of mirrors, giant Plinko type wall, and thermal imagery you could create. I look forward to visiting again and can’t wait to see what the inventors come up with next at the next Maker Faire. Le Fooding, a French foodingguide in France, decided to bring their Campfire Session #2 to Brooklyn’s waterfront in Williamsburg. I attended last year’s Campfire Session in Manhattan and the very first NYC Le Fooding event in 2009 in Queens. Both events were special and wonderfully organized bringing talented chefs together in one space. Patrons were fed, entertained with music, and free to roam around a beautiful art space. 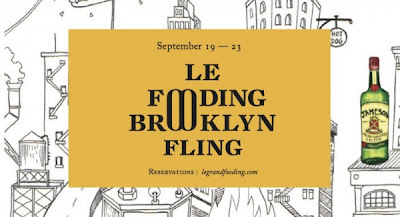 Le Fooding was an event that I became a huge fan of. It was an event and organization that I believed in and was willing to invest in. They always donated a portion of their proceeds to charity (Action Against Hunger) and the vibe of the events were not for profit, but rather the celebration of food and positive environment it could create. Last year’s first Campfire Session was an intimate affair. The number of tickets sold were minimal and the outdoor space it was held in felt like a backyard. There was more than enough food to go around. Patrons got seconds, even thirds, despite the strict ticket per serving allotted. The musical guest was popular Norwegian crooner Sondre Lerche. It was an amazing success. We ended the night with music, ginger ale and Jameson, and Van Leeuwen Ice Cream. This year’s campfire promised musical guest Mos Def and five tastings which showcased the innovation of Brooklyn’s food scene. It was promising and had an air of coolness. After all, Brooklyn itself had developed a bit of a reputation. Artisanal, hipster, creative, new, and trendy are just a few words to describe the “Brooklyn” scene. The event turned out very different from previous years. There was a strict guest list and the people manning the guest lists checking people in had no idea what they were doing. Each line had a different list and each entrance was left unmarked. Was one line VIP, for Mastercard users only, A-L, M-Z? The world will never know. We were just lucky to pass through the gates after receiving an apology for the process that took too long. The event took place at the Williamsburg Flea Market. The bad thing was that the flea market stayed open while Campfire Session #2 was going on. It was confusing. Where we supposed to shop? The vendors looked bored and out of place. Food lines snaked by each tent and overall the event looked secondary to the flea and was cramped. Hosting Campfire Session #2 in the middle of the Williamsburg Flea gave Le Fooding less of an importance. It didn't feel special anymore and was more like a nighttime Smorgasburg, the daytime Saturday food festival held in this very same location. As for the food, it was tiny and too much of the same. I guess Brooklyn is big on sausages because three out of the five plates I tried that night were sausage. One of the booths Mission Chinese ran out of tastings halfway through the event. I had to beg another booth to accept my Mission Chinese ticket for a plate of food. Thank you Brooklyn Bangers for being so understanding and delicious! I wish John Legend were there to fill in the musical act performance. Aside from the food aspect, Campfire Session really prides itself on their musical guest. I was looking forward to Mos Def. Shortly after I bought my ticket online, I got an email saying Mos Def would not be there and Dave One of Chromeo would be filling in. My mistake was thinking that Dave One would show up with a keyboard and sing Momma’s Boy but he was without his other half. He stood there on stage and no one knew who he was. He should have had a banner or an announcement but had nothing and we were all waiting for something. Before we knew it the stage was being disassembled and we were being kicked out. We were all waiting for the main act but little did we realize we just witnessed it. I left hungry and feeling ripped off. I imagine this was the feeling people felt after Googa Mooga, an event I was totally satisfied with. Then again, I didn’t pay $250 for my Googa Mooga ticket. I was perfectly fine with waiting in line for an hour and spending $15 for Blue Ribbon fried chicken. I doubt I will go to another Le Fooding event in the future. I’d save my time and sanity and just donate $15 to Action Against Hunger. Charity shouldn’t suffer out of mistakes, nor should my ears and stomach. A year has passed since year one of Writing Workshop. A lot has changed since then. Our founding group of two grew to three and now involves a rotating cast of eight writers. Since there are more people, the session lasts longer with just enough time for everyone to read their piece out loud. To keep organized, we now use Google documents with a number of tabs. We meet twice a month, every two weeks. It’s tough settling on a day/time when everyone is available so we compromised and rotate between Tuesday/Wednesday and Thursday/Friday. Our calendar tab keeps track of every Writing Workshop date throughout the year. Our sessions are not meant for critique anymore but rather to hear our own writer’s voice. If editing is requested, we have a number of writers in our circle who are available to help. This is the list of writers interested in our Writing Workshop. All contact information is kept here. We also created a Google Reader feed that bundled all of our blogs. This keeps us up to date on what we have been writing and working on. Special thanks to Restaurant Baby who has kept us organized, inspired, and on track by implementing all of these resources. I was going through Twitter and came across an article about writing groups. 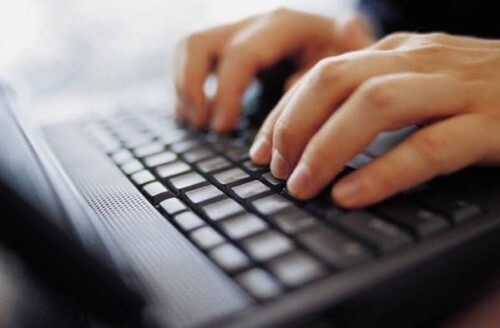 The article went through a few important points about finding the right writing group. -Does your writing group’s goals align with yours? -Is it a supportive environment? -Is the group’s size right for you? My Writing Workshop has evolved and I love it just as much as I did day one. It’s low pressure, casual, and inspiring, encouraging, and productive all at once. Everyone is supportive of each other. This group grew through word of mouth. I trust that all of my friends will only bring good people to the table. It’s interesting to see how new members react to the format and experience. I have seen professional writers shy to read and then own the spotlight, I was amazed to see and hear a script brought to life through acting, and over and over again I am thrilled to learn that others find what I write interesting and are eager to read more of my work. Even though we have a larger group now, the number is just right. We are still at our local cafe and the outlets, chairs, and tables available have been enough to accommodate us. I’m curious and excited to see how year three Writing Workshop unfolds. Its so far, so good with a few more laptops, netbooks, and iPads to round out the bunch. As Restaurant Baby likes to say, "Write On!" One thing I’ve always wanted to do but others found cheesy was to visit the Madame Tussauds wax museum. I remember watching a tv special on Madame Tussauds when I was a child. They carved a wax figure to look just like Olympic Figure Skater Michelle Kwan. It looked exactly like her! Very realistic and kind of creepy. You could look into the eyes of a Madame Tussauds wax figure and wonder if it will blink back at you. It is no secret that I am obsessed with celebrities. I like to document all my star sightings. After visiting the Madame Tussauds wax museum in New York I can honestly say that it is a really cool place and not cheesy at all! The Manhattan museum is over 85,000 square feet, has multiple levels, and different rooms which groups wax figures. Interested in athletes? Musicians? Politicians? Bollywood actors? Comic book characters and superheroes? 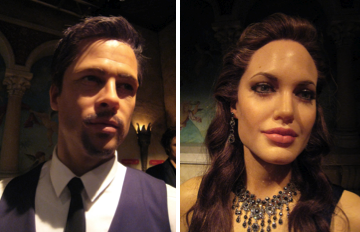 Madame Tussauds has it all and you are encouraged to take pictures and interact with the figures. I had a field day with this and felt like a celebrity myself rubbing elbows with life sized replicas of celebrities I read about in US Weekly and Yahoo news. Even though Madame Tussauds is from London, the New York location is special because it pays tribute to all the famous New Yorkers: Broadway stars, Al Roker and Matt Lauer, Woody Allen, and more! Stay tuned for pictures of my Halloween photoshoot at Madame Tussauds!